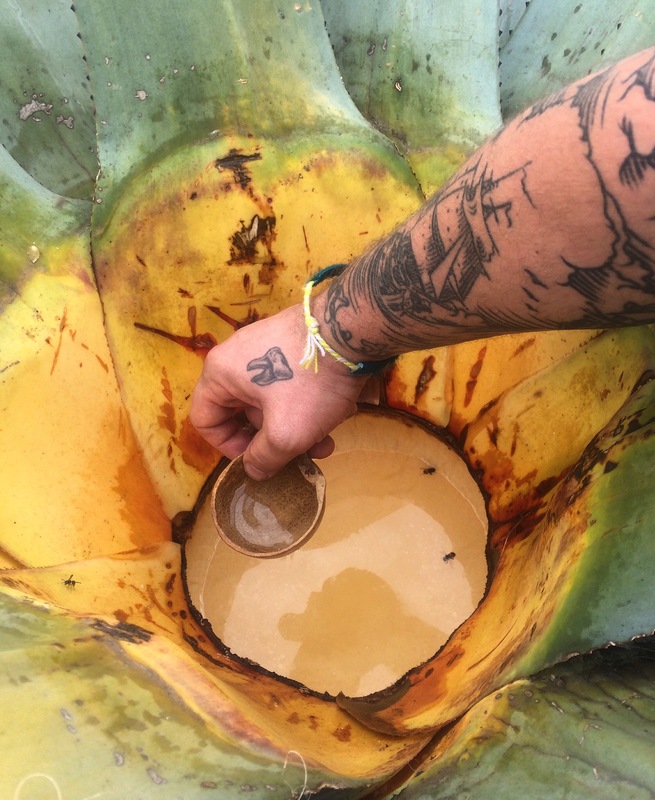 With agave distillates continuing to grow in popularity, mezcal in particular, adventurous spirit enthusiasts are traveling to Mexico at unprecedented rates. 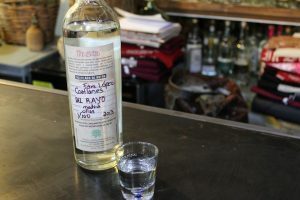 If you visit Oaxaca today, chances are strong you will bump into other mezcal connoisseurs and collectors – or perhaps even an educational agave tour group, like the ones led by Tequila Tours or the bartender-focused Puro Burro. 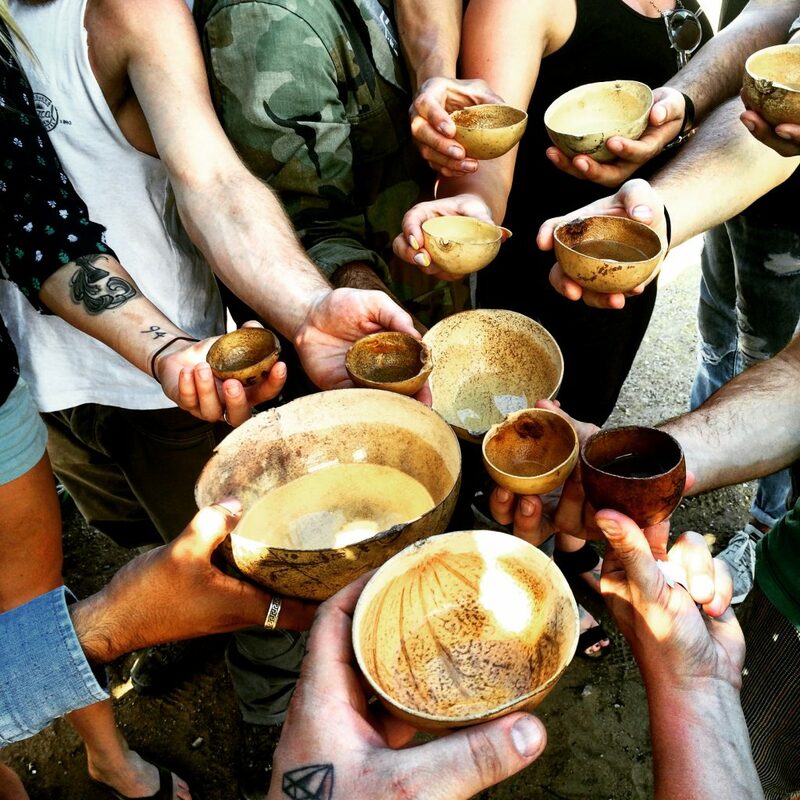 There are few places and few moments in spirit history more exciting to explore right now than Oaxaca, the place is special even without the booze. Surrounded by mountains, the deep Oaxacan valley is home to a thriving Zapotec native culture, and the terroir ranges from sheer desert peaks to plush river beds overhung with greenery. And then there’s the food. Oh, the Oaxacan food. So, we all want to get on a plane to Oaxaca City. Like, now. And there are tours available, to be sure. Choose a hotel or hostal in downtown Oaxaca City as a home-base. Choose something within walking distance of the Cathedral of Our Lady of the Assumption. It’s a good center point for everything else you’ll want to do around town, and an easy landmark to find from anyplace you may wander. We recommend Hostal de la Noria as a particularly mezcal-friendly establishment. After depositing your luggage, your hotel should be able to acquire you a vehicle and/or driver for your explorations. Before you leave, head to a corner store to stock up on some bottled water (the rumors are true – don’t drink the tap) and grab a cup of coffee or tejate (hot chocolate) to invigorate you for the day ahead. Start small. For your first expedition, head southeast on 190 to the village of Matatlán. You will pass by countless tiny “Mezcal Artisanal” palenque distilleries along the side of the road; don’t waste your time, unless you have far more than three days to explore. However, keep your eye open for Comida Jessica, a little café with red walls and an outdoor stove, which you will pass on the right hand side on the edge of Matatlan proper; the family who runs the café make some of the simplest and best food you will ever consume. Their tlayuda (like a beans & veggies Mexican pizza) is divine, with their tortillas pressed by hand beside you to order; their tejate is among the best we’ve ever tried. If you go early enough in the morning (they start serving around 5am) you’re likely to bump into a local mezcalero, dropping by for a bite before heading to work. Continue to Santiago Matatlán and make your way to the Agave de Cortés family distillery. With a bit more infrastructure than some of the more rural palenques you’ll visit, Casa de Cortés is an excellent first visit to a true mezcal institution. The Cortés family has been distilling mezcal in Matatlán since at least 1840, and they are the brilliant minds behind the creation of El Jolgorio and Nuestra Soledad, in addition to their own Agave de Cortés brand. At their family palenque, brick walls sport clear signage which details the different stages of mezcal production, making it easy to follow the process as you explore their massive wooden fermentation tanks, deep earthen ovens, and stone tahona for grinding the agave. The family’s expressions are mellow and rich, with a gentle smoke and a versatile, approachable style. If you’re lucky, Valentín Cortés himself will be there to offer further guidance with the aid of his son, mezcalero and the family illustrator, Asis Cortés. If you’re even luckier, maybe you’ll get to try a fresh batch of Mexicano or Tobalá…. 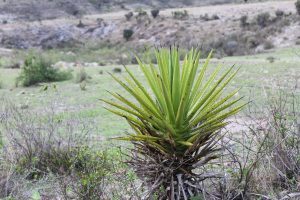 While you’re here in Matatlán, stay on 190 and track down the agavayero fields of CEMOSA, a sustainable commercial producer of agave for mezcal. They give excellent tours, and there will nearly always be an opportunity to see every stage of agave growth and harvest, as they produce in rotation on over six hectares of agave, turning the spent rows to make room perpetually for new hijuelos (baby agave seedlings). There are around 60 varieties of agave growing today in Oaxaca, but CEMOSA only cultivates the most popular and densely sugared variety, Espadin. Ask your hosts for a little hibiscus tea, then take a stroll among the rows of agave, taking the opportunity to feel the skin of their leaves and the sharp tip of their spines – but be careful! Those spines can be sharp enough to puncture a car tire. At this point, you’re probably getting a bit hot & tired (and no doubt you’re beginning to thirst for a drink). 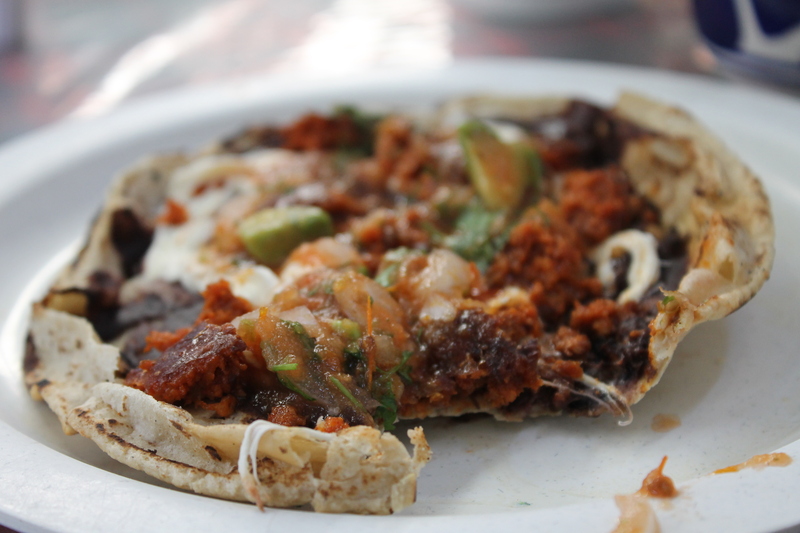 Before you leave Matatlán, check out a Pulqueria, such as Los Insurgentes. 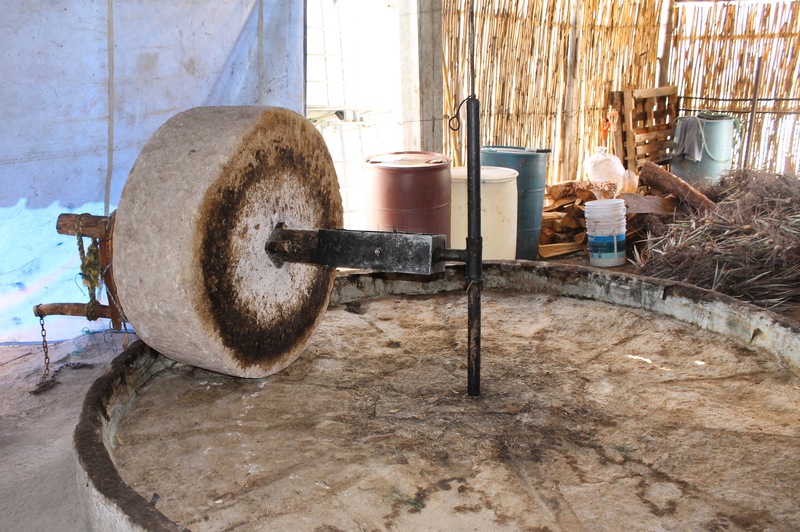 Pulque is a fresh fermented beverage made from agave nectar – think of it like agave wine – tasting of like sweet honey and slightly sour milk. Freshly made, it is mind-numbingly delicious, and can only be experienced close to the source – when it is packaged and stored for later consumption it loses nearly all its best characteristics. No visit to Oaxaca, and especially the agave fields of Matatlán, can be complete without a few sips of the freshest Pulque to be found. Hit the road bright and early so you can drive several hours south-southeast, taking 175 into the Central Valley, until you hit San Baltazar. There are several great palenques to visit here, but no one hosts better than Gregorio “Don Goyo” Martínez Garcia at his Palenque, 3 Mezquites. Surrounded by rose bushes and bright, vibrant foliage keep your eyes peeled for the plethora of wild Tobalá and Tepeztate which litter the hillsides as you approach the village. 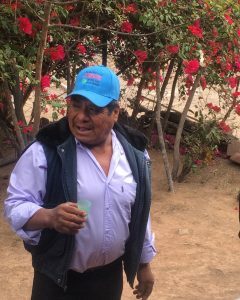 If you charm Don Goyo just right, maybe he’ll give you a taste of some of the private stock mezcal he ages in black clay – a hint: the man loves to dance. From San Baltazar, take a trip due east and track down Hierve el Agua. 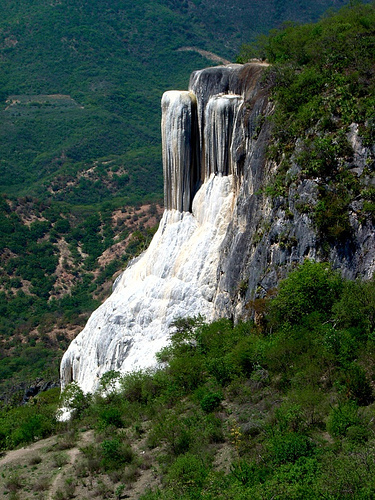 This awe-inspiring landmark is a massive rock formation which resembles a petrified waterfall. Created by natural springs which are over-saturated with minerals, the epic white rocks lift from the valley basin over 2700 feet; best of all, the peak features a collection of natural and man-made spring pools which you can swim in, with alternately cool and warm water bubbling up from inside the stone you stand upon. One of the pools is formed against the edge of the plateau, allowing you to float in the spring water as you gaze out over the never ending valley of Oaxaca below you. Make sure you also stop and snack at the market above the waterfall; more tlayuda, tacos and micheladas galore await you. Finish up your long day of driving by heading another hour or so southeast, to Santa Caterina Minas, home of the legendary Real Minero. The importance of Don Lorenzo Mendoza and his daughter Graciela Angeles Carreño cannot be overstated. While they produce arguably some of the most traditional mezcal in Mexico – the Minero style, distilled on seemingly ancient clay pot stills, using nothing more than bamboo shoots, string and a wooden spoon, sealed with spent agave fiber and water – they are also at the forefront of documenting, cultivating and protecting species of wild agave, and pushing the respect for traditional Zapotec mezcales and non-invasive production methods such as glass aging. Their new palenque, with its foundations built about 38 years ago, is a powerful symbol of both the deep history of mezcal and the bright potential future of those traditions. After touring the palenque and witnessing the magic of the clay stills, be sure to taste some Real Minero. You will find no better example of the power of a specific palenque’s microclimate. The powerful, lingering scents of Santa Caterina Minas dwell in every bottle of Real Minero, and even when you return home to the States you’ll find yourself transported every time you open one up. Drive home quick, because you have a long way to go. This evening, take dinner at Los Danzantes, the restaurant that is also home to several iconic early export mezcales. Pay tribute and share a toast to how far we’ve all come! After dinner, head over to Mezcalogia, the mezcaleria owned and operated by the brilliant Cortés family you met yesterday. Experiment with some of their tiny, limited releases and even try a few mezcales from other states… If you catch Asis at the bar, buy him a round! And then listen and learn from one of the world’s best mezcal educators. Be careful – don’t try to keep pace with a mezcalero! Men like him have a lifetime of learning to respect the spirit of the maguey… and you still have one more day to go! But if you really do tie one on at Mezcalogia, which is a shockingly easy thing to do, we have the cure – go to El Lechoncito de Oro, a late-night taco truck that offers service from 10pm to 5am on Av. Ferrocarril. Far and away some of the best snacks in the city, and at that hour (with a belly full of mezcal) you soul will thank you. Be sure and get the chicharonnes and a torta or two. Another early start! Make your way first thing to the city’s massive open-air market. Truly a life changing experience, complete with live poultry, traditional snacks, machetes for sale, and more hot peppers than you could consume in a lifetime. Be sure and find some of the butchers to sample their wares straight off the grill, and definitely catch some mushroom tortillas and sopa de chivo (goat soup). If it’s a Sunday, you’re doubly in luck – the markets in Oaxaca explode on the Lord’s Day – especially the market in Tlacolula, about 45 minutes east of downtown. After the market and some snacks, it’s time for your final palenque visit. Hit the road hard, you have a four hour drive north and west to Santa Maria Zoquitlán, a rough and earthy little village which is home to some of the best mezcal in the state. Take note: you will lose cell phone reception on this drive! Legendary distillers like Rey Campero make their home here, but if you’re really in the know go visit Don Ignacio Parada Valera, also known as Don Chucho. Master of all agave Karwinskii (try his mind-blowing Madrecuixe to learn some of the true power behind that varietal), Don Chucho occasionally also produces remarkable Tepeztate and even the rare Jabalí. His palenque is located directly beside his house, tucked among mango and pineapple plants he’s cultivated for decades. A living legend, Don Chucho is a gracious host and along with his son José he crafts some of the finest and most soil-driven spirits in Mexico. 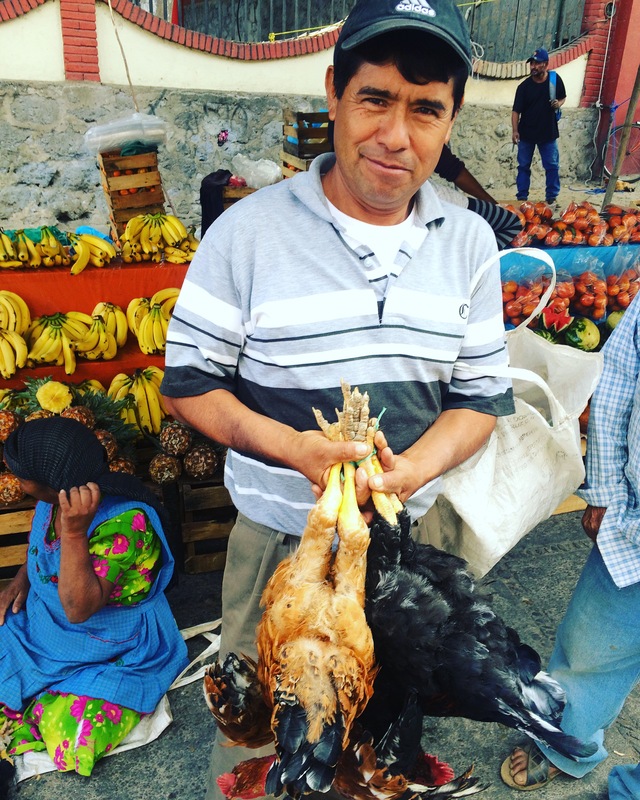 And he’ll probably sell you some on the spot for the long drive home to Oaxaca City. Consider yourself lucky… and warned. Upon returning to Oaxaca, you should have time for one last evening on the town. Try out Mezquite, a lovely and forward-thinking restaurant near the Cathedral. Sit on their balcony, if it’s available – it offers spectacular views of the surrounding city streets, and a good vantage point from which to eye any street celebrations you may want to go join. For your last mezcaleria, be sure to visit In Sitú, which is home to over 180 unique and rare mezcales from all around the country. A deeper library of agave distillates surely cannot be found – but don’t get too attached. 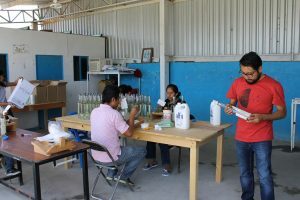 Unlike Mezcalogia and Mezcaloteca, it is rare for them to house enough of any bottling to sell to a visitor. But it never hurts to ask! The hardest part of any trip to Oaxaca is the moment when it’s time to leave. VAYA CON DIOS and DIXEEBE!